[ad_1]Wildlife and Landscape Last night we had a One to One with Jack. We worked on Landscape, Long Exposure with ND filters and Wildlife. And, we saw a fellow (last photo) who had misjudged the incoming tide and was trapped on the rocks between the Pinnacles and Sentinal Rock (Cowrie Patch Beach). I hope he made it out ok, last we saw he was boulder hopping towards the Pinnacles. [ad_1]Help Me Out With This Wallaby Hey Guys, When I am out on the Cape Woolamai Track I see heaps of Swamp Wallabies. Some I even know by sight (see the last photo of Nick below). But there are several wallabies up there with long blond to reddish fur that looks like a different species to me. I'm wondering if you know, or know someone, who could have a look at the first two images and confirm its a different species, a stage of moulting of the Swamp Wallaby, an illness or a genetic variation? The second image looks like a healthier wallaby but had distinctive reddish fur longer than what I see on Swamp Wallabies. 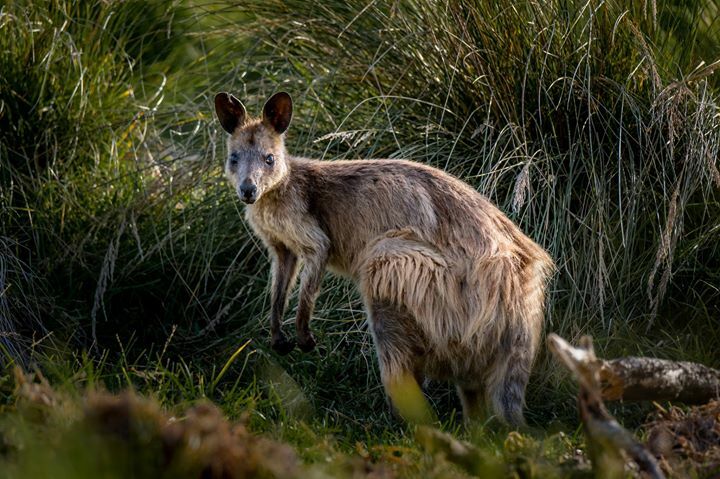 The other shots are of the common Swamp Wallabies on the track, including my favourite wallaby mate, Nick. [ad_1]Bit of This, Bit of That This morning's very early One to One session had a little bit of everything on offer - massive swell, beautiful morning sky and a moody Cadillac Canyon. Long exposures shot with a Fujifilm XT10 and 14mm f/2.8. Zoom wave shots were taken with a Fujifilm XT3 and 100-400 f/4.5-5.6. [ad_1]Land of Awe Last night I had the opportunity to access a private beach down on the Prom with two other legends. This was an amazing beach with breathtaking rock formations and views of Cape Liptrap Lighthouse. Along with these cool rocks, we also shot an old shipwreck laying on the beach. I'll save the wreck photos for another day. These were shot with a Fujifilm XT10 and 14mm f/2.8 lens on a Mefoto Globetrotter Tripod carried in a Shimoda Design 40L camera bag. [ad_1]All you Aussi's check this out! The big question .... will they deliver to CAPE WOOLAMAI, Phillip Island? A Mornington Peninsula first... Beer delivery by drone this Australia Day! We are going to be delivering the Honey Kolsch in cans which is a collaborative brew with Dainton Beer, Jetty Road Brewery, Mornington Peninsula Brewery, Red Hill Brewery, St Andrews Beach Brewery, Mr.Banks Brewing Co and of course Pure Peninsula Honey. We will be announcing the next one SOON! And special thanks to our supporters: Athabasca Filters Samyang Optics Australia MeFoto Australia The Sheltered Glamping Co.
[ad_1]Epic Ben, Epic Weekend Using Athabasca filters to capture Ben of Benjamin Eriksson Photography getting the shot during our Megaphotography Weekend. Taken with a Fujifilm XT3, 14mm f/2.8 and Athabasca NDX filter. That's a wrap! MegaPhotography Weekend #5 has finished. Benjamin Eriksson Photography and I will be announcing details for #6 SOON! Here's a quick vid of me doing the Shimoda and Temba Bag shuffle after our 5:30am sunset shoot this morning. [fb_vid id="289365885063232"]That’s a wrap for Mega Photography Weekend No. 5! Dale from Photo Rangers was in a spin, after we finished our sunrise workshop down at Cadillac Canyon. Photos from the weekend to come! I’d like to thank all our participants for joining us, we loved sharing our knowledge with you. Thanks to The Sheltered Glamping Co. for our awesome accommodation, Samyang Optics Australia, MeFoto Australia and Athabasca Filters Australia our gear sponsors for the weekend. MEGA Photography Weekend 5 starting now! [fb_vid id="365223260939558"]Photo Rangers and I were live over on Instagram a few minutes ago at The Sheltered Glamping Co. Where our workshop attendees will be staying tonight. [ad_1]MEGA Weekend I'm looking forward to meeting everyone on our Megaphotography Weekend with @benjamineriksson.photography . If the conditions are right we'll head to our little secret long exposure spot - Panhandle Flats. [ad_1]Social Media & the Environmental Consequences Earlier this year I wrote about how social media has 'complelled' photographers to seek iconic shots often resulting in negative environmental consequences all over the globe and even on Phillip Island. Cecilia has wrote a short piece about this impact below. If you are a photographer, I encourage you to read it. Protecting shearwaters: the impact of “instagrammability”. It is a special time on Phillip Island …. special because of shearwater chick season. Short-tailed shearwaters are petrels. They are migratory birds that travel between Australia and the Bearing Strait near Alaska. It takes 4 weeks to make the journey, a distance of 15,000 kms each way. Millions of shearwaters are currently on the Island and the birds are either sitting on eggs or taking care of their newborn chicks. Thus, all burrows are occupied. It is a special time but also a sad one. Many of these burrows will be crushed and the eggs destroyed, or birds and chicks killed, because walkers along the Phillip Island coastline, from Cape Woolamai to Summerlands, do not stay on the path. And when I say walkers, I mean mostly photographers. What happens when you crush a Shearwater burrow? You trap the birds inside because the entrance collapses. They suffocate to death. You crush the eggs and the hatchlings. These birds fly 15,000 kms to breed and nest here … and they die because the desire to get that perfect “instagrammable” shot for a photographer is too tempting. Instagram has a lot to answer for its contribution to the destruction of the environment. The platform's capacity to promulgate millions of images from “instagrammable” locations causes much destruction. See for yourself. Just google “places ruined by Instagram”. Despite many photographers being environmental advocates, the desire for ‘likes’ and ‘followers’ overrides their affiliation with nature. Take the Pinnacles, for example, in Cape Woolamai. Many photogs seek that long exposure sunset shot or an astro shot from the bottom of the rock formations. The location is beautiful and makes for a spectacular image capturing the majesty of nature. But to get down there, many walk down the hillside … where there are hundreds of shearwater burrows hidden within the lush expanse of the New Zealand spinach hugging the cliff face. The cliff face appears inviting because of its undulating topography. It seemingly suggests there are solid footholds on the way down. But those undulations are burrows. They are there for birds, not for human feet. There is an old penguin track that takes you to the bottom - the remnant of a penguin colony long gone from the impact of human activity. But to get to the track you have to walk off the path. There is signage there saying not to go further … because there are burrows there too, amidst additional dangers. For those of you taking photographers out there, please do not encourage them to go down to the bottom. If you absolutely must ‘get that shot’, walk from the beach at low tide and during a small swell when the sea is not so angry. And most importantly, don’t encourage photographers to share those shots on Instagram. If these shots are so special, why not print them out, frame them and hang them on your wall rather than share them on social media where there are thousands of other shots just like yours? Because when these shots are shared on Instagram, others will come by the thousands, and these thousands won’t know how to get to the bottom. These thousands will crush the burrows to get to the bottom just to capture that perfect “instagrammable” shot … for the sake of “likes” and more followers. I, too, have been guilty of this. I have walked off the path, down that old penguin track to get that shot. But no more. I won’t do it. The flora and fauna on Phillip Island contribute to the ecosystem beneficially. We humans do not. I do not. This is a love poem, but I think it also captures the voice of nature, asking humans to take care, to tread softly and not shatter the dreamscape that mother nature has given us to treasure. So please tread softly … because Instagram likes and follows are cheap. That’s why the platform allows you to buy them for a few dollars. “Instagrammable” shots are easily duplicated; they are neither unique nor original. Moreover, they are ephemeral, lasting as long as a scroll down the page. Nature can’t be duplicated and edited. She won’t be here for ever. [ad_1]Some of This, Some of That This Saturday night we'll be shooting long exposures AND Astro Photography at Cadillac Canyon. If you want to join us on this workshop, let me know ASAP. See details under Events on the Facebook P a he or Website. [ad_1]Some of This, Some of That This Saturday night we'll be shooting long exposures AND Astro Photography at Cadillac Canyon. If you want to join us on this workshop, let me know ASAP. See details under Events on this page. [ad_1]Adventure Weekend with Us I've just spent some time with Benjamin Eriksson Photography preparing for our upcoming MegaPhotography Weekend #5. We'll be offering 2 big workshops during the weekend using Athabasca Camera Filters. Ben and I put the Athabasca Filters through the paces at 11 am at Cadillac Canyon with amazing results - see the shots below. We still have a couple of spots available, if you are interested, contact Ben or I asap.